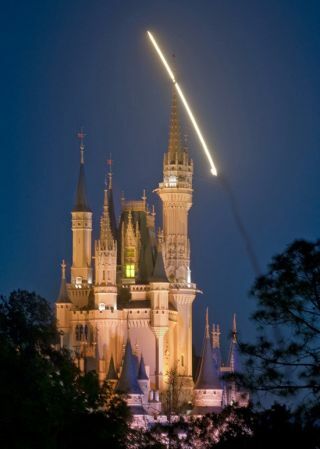 NASA's space shuttle Discovery soars over Cinderella's castle at Walt Disney World in Orlando, Fla., on April 5, 2010. When NASA's storied space shuttle fleet retired last month, it sparked a flood of commemorative events across the country to honor the 30-year spaceflight program, even from the "happiest place on Earth." Through the end of September, Walt Disney World's Swan and Dolphin Hotel is offering current and former NASA employees and contractors a special NASA rate, the hotels announced. Walt Disney World, in Orlando, Fla., is a mere 60 miles (100 km) west of NASA's Kennedy Space Center in Cape Canaveral, where the shuttles launched and usually landed. The deal is offered "as a special tribute for those responsible for our nation's space program," according to a statement from the hotel. The special rate for shuttle workers is $135 per night, in honor of the 135th and final space shuttle mission, STS-135, which flew in July 2011. NASA retired its three space shuttle orbiters this year after three decades of service. The shuttles are being processed now in preparation for going on public display at museums around the country. Thousands of shuttle workers across the country are expected to lose their jobs. Meanwhile, NASA plans to build new spaceships capable of taking humans to an asteroid by 2025, and to Mars by the mid 2030s. Through Dec. 25, 2011, the Swan and Dolphin Hotel is also offering a special space-themed "Salute to Space" package to the general public as a way of "honoring the nation's space legacy," according to the statement. On select dates in August, former astronauts Jon McBride or Bob Springer will be on hand to meet with guests, hotel officials said. For more information or to reserve the hotel packages, visit www.swandolphin.com or call 1-800-227-1500.